Meter Dose Inhalers (MDI) are often used for the treatment of asthma. They consist of a small canister which holds medication under pressure. The medication is released by pressing down on the inhaler. 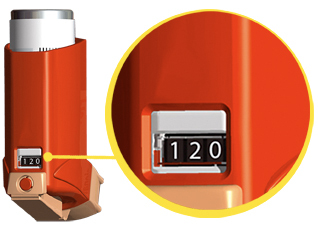 Meter Dose Inhalers include rescue inhalers such as ProAir HFA, Proventil HFA, Ventolin HFA, Xopenex, and asthma controllers like Advair HFA, Flovent, QVAR, and Symbicort. I call this the "breathe and click" technique. In short, you want to breathe in nice and slow, and activate the inhaler shortly after you have begun breathing, and continue to inhale to bring the medication particles into your lungs. Shake the inhaler to ensure that the medication is well mixed with the propellants (check the instruction sheet that comes with your inhaler, as some inhalers do not need to be shaken). Stand up or sit up straight, and breathe out deeply. Place the mouthpiece in your mouth, between your teeth, and close your lips tightly around the inhaler. Make sure your tongue is out of the way. Start to breathe in slowly than, a split second after you start breathing in, activate the inhaler once as you continue to breathe in slowly for several more seconds. The goal is to get the medication to mix in with the air you breathe so that it is carried deeply into your lungs. A slow long steady inhalation is better than a quick short breath.